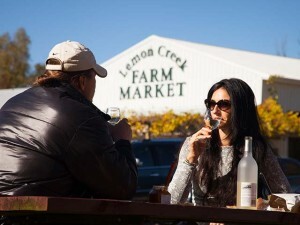 Lemon Creek Winery and Farm Market is one of southwest Michigan’s largest fruit farms — continuing a family tradition that dates back over 160 years. We take pride at Lemon Creek in growing the highest quality fruits to enjoy year after year from our family to yours. Our farm-fresh produce is available seasonally — whether you pick your own or shop at our farm market. Open daily during fruit season, you can visit our winery and farm market in Berrien Springs seven days a week. The Farm Market is closed for the season. Thanks for visiting us this past year, we’ll see you at Cherry Time! Dogs and other pets are not permitted within the orchard or vineyards as is mandated by the Food Safety Modernization Act (FSMA); We do have a grass picnic area outside where dogs are allowed while on a leash and under the supervision of their owners. This is a tentative schedule, availability of fruit changes year to year depending on the weather… Pure Michigan!